For most of us, riding and training doesn’t stop just because the mercury dips below freezing. But cold weather presents a number of challenges besides trying to figure out exactly how many layers to wear. 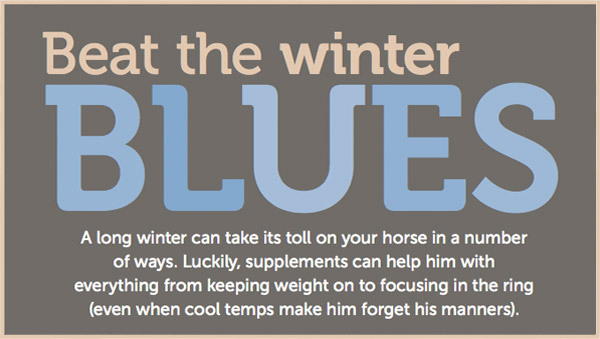 Fortunately, the right supplements can help with many of the struggles that come with chilly weather. Ever notice that your horse gets too hot to handle right when the frost starts creeping in? You’re not alone. With limited turnout and chilly temperatures, many horses are more “on edge” this time of year. If you start every ride feeling like you’re holding on and hoping for the best, a calming supplement may be able to help. But with all the different formulas and ingredients, it can be tough to know where to start. Vitamin B1 plays a critical role in the transmission of nerve impulses and the breakdown of carbohydrates. Proper nerve function can reduce excitability, making Vitamin B1 a popular choice in calming supplements. Vitamin B-1 by Vita-Flex (#10042, $12.95) provides 1,000 mg of B1 per serving, making it an easy and economical source of this important nutrient. Magnesium is a macro-mineral that is crucial for healthy muscle contractions. Horses deficient in Magnesium can exhibit nervousness and muscle tension, so this ingredient is often found in calming supplements. Add a healthy dose of Magnesium to your horse’s diet by supplementing with Quiessence (#10017, $22.95). Or combine the benefits of Magnesium and B1 by feeding Ex Stress (#11818, $33.95). L-Tryptophan is an essential amino acid that is converted by the body into serotonin, a hormone that increases feelings of well-being and contentment, to calm and soothe. SmartCalm® Ultra Pellets® (#17477, $25.95) supplies your horse with L-Tryptophan, in addition to the benefits of Vitamin B1 and Magnesium. Herbal calming supplements can include ingredients known as “nervines”, herbs that have specific actions on the nervous system. Popular nervines include Valerian, Vervain, Chamomile and Hops, all of which are believed to rebalance the nervous system for a soothing effect. Raspberry leaves, like those in Mare Magic (#14738, $12.95) are used to help balance the hormonal systems of moody mares. To address both the hormonal and nervous system, try Easy Mare (#10745, $41.95) or RelaxHer Blend (#10006, $38.95). 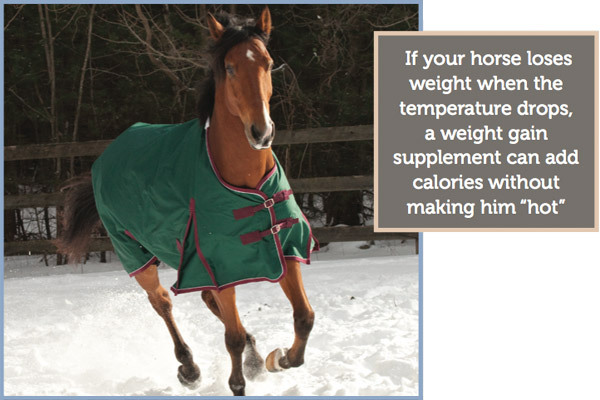 Your horse’s metabolism kicks into high gear in the colder months, to fuel the internal furnace that helps him stay warm. But chilly temperatures and decreased exercise often make for more excitable horses. So how do you balance keeping weight on your horse and keeping him from bouncing off the walls? The best way to help him turn up the heat is to increase his hay consumption. However, if adding hay isn’t enough, you may want to consider adding a weight gain supplement, instead of pouring on the grain. Quality weight gain supplements supply the vast amount of their calories from fats, which are “burned” for energy much more slowly than starches, like grain. As a result, you won’t see that same “sugar high” effect. In addition, some weight gain supplements contain protein for lean muscle support and ingredients for digestive health. If you want to help your horse maintain his weight this winter, consider feeding a customer favorite like SmartGain 4® (#14505, $26.95) or Cocosoya Ultra SPTM (#13525, $24.95). You can lead a horse to water, but you can’t make him drink — especially if the water is only a few degrees away from turning into a block of ice! Dehydration can have serious consequences any time of year. If your horse is reluctant to drink cold water, he could be at risk for anything from muscle stiffness to colic. That’s why many owners add an electrolyte like SmartLytes® Pellets (#19585, $12.95) or Apple-A-Day (#10034, $9.95) to their horses’ feed year-round, (not just during the hot summer). If you prefer to offer pure salt, hang a Himalayan Salt Block (#14870, starting at $9.95) in your horse’s stall or paddock, or add it to his SmartPaks. Wintertime often translates into more time spent indoors. Whether he’s cooped up in a stall or being ridden in the indoor arena, increased exposure to dust and airborne debris can irritate your horse’s airways. If you notice a problem, such as a cough, it’s always best to have your horse checked by your veterinarian to determine the cause. Adding a respiratory supplement like SmartBreathe® Pellets (#18915, $29.95), Cough Free (#10060, $15.95) or Freeway (#15570, $44.95) may provide additional support.